1. Preheat the oven to 190ºC, gas mark 5. In a large roasting tray toss together 1 tbsp of the olive oil with the carrots, cumin, honey and half the crushed garlic. Roast for about 25–30 minutes until tender, shaking the pan halfway through the cooking time. 2. While the carrots are roasting, make the tzatziki. Stir together the remaining olive oil and garlic with the yogurt, cucumber and a pinch of salt. 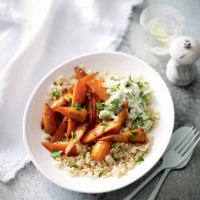 top with the roasted carrots, and serve with a spoonful of tzatziki and a sprinkling of chopped parsley. For a delicious alternative, try swapping the carrots for some cauliflower florets.